As one of the premier hiking spots in the Kanto region Mt. Kinpu certainly didn’t hesitate living up to its infamous reputation. Over the span of this hike you will be transported through breathtaking scenery as you plod upwards to its peak. While the hike can be done year round, provided of course you are well kitted out, it best probably done before the end of November while public transport options remain viable. Also unless you’re a glutton for punishment neither Mt. Kinpu nor Mt. 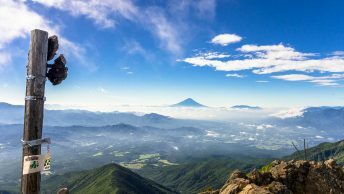 Kobushi are realistic day excursions from Tokyo and are best undertaken as a more leisurely overnight trip or combined into a three day walk. If you’re coming from Shinjuku getting to the trail head will take a little over four hours if using a local train service. In this case take a train heading for Takao and transfer to a Matsumoto bound train. With a bit of forward planning you should only need to transfer one time. Exiting Nirasaki station 韮崎駅 look for bus stop no.2 where you can pick up a direct bus to the Mizugaki-sansou 瑞牆山荘 (1hr 15 mins, 2,060 yen) click here. The price is a little steep but when you think of the alternative it works out to be a pretty good deal. The trail starts in front of the Mizugaki-sansou where after about 20 minutes you come to a nice resting area overlooking the jutted peaks of Mt. Mizugaki. A little further on before reaching the Fujimidaira-goya 富士見平小屋 the trail splits with the option of heading left to Mt. Mizugaki. There is also a water hole just below the hut. The Fujimidaira-goya has a nice campsite and provides an attractive option to lugging your gear to either peak. From here follow the ridge up to the Dainichi-goya 大日小屋 and after about 90 minutes you will arrive at the Dainichi Boulder 大日岩 an enormous rock conglomeration which contrasted exquisitely with the blue autumn sky. If you’re on the early bus it makes for an impressive lunch stop. The following section begins a rather long climb taking around another 90 minutes to reach above the tree line. It is from here the true grandeur of Mt. Kinpu 金峰山 (2,595 m) comes into view. Take care as you scramble over boulders especially in the case of snow. From the sheer escarpment off to your right views of Mt. Fuji augment the stunning backdrop. Nearing the summit you should be able to glimpse the Kinpu-goya 金峰小屋 on your left. A small shrine has been erected a five minute walk from the true summit. The only hikers I encountered were a small group staying at the Kinpu-goya. Reaching the summit a little later than anticipated I had little time before having to set off for Oodarumi-toge 大弛峠 another two hours away. Continuing east from the summit you again dip under the tree line. 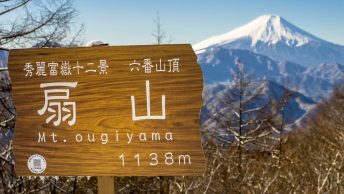 The Oodarumi-toge has the claim of being the highest accessible roadway pass in Japan at 2,365 m. The Oodarumi-goya 大弛小屋 has sheltered campsite with a water hole (600 yen). Given the approaching typhoon the only other campers set in for the night were a father and son duo. The first tell tail signs of the impending typhoon system were already evident – grey clouds and a light mist. I hastily ate breakfast and got my gear packed away. Like clockwork the rain started just as I headed off to the first point of call Mt. Kokushigatake 国師ヶ岳 (2,591 m). By the time I had reached the summit (1 hour) the rain had settled in with earnest and had resigned myself to it for the next 6 hours. Lifting my spirits was the beauty that comes with walking through the rain and secure knowledge that at least all my gear was well waterproofed. From Mt. Kokushigatake it takes around 2 hours to reach Higashi Azusa 東梓. My original plan was to take lunch a little further along at another rock outcrop though the unrelenting rain decided otherwise as I soldier on and grabbed a short break under a fallen log, the only respite I had. The final push up to Mt. Kobushi 甲武信ヶ岳 (2,475 m) takes another 2 hours with the last steep climb testing my endurance and resolve to get into a warm sleeping bag. Nearing the top of Mt. Kobushi requires scampering over loose rocks to reach the summit. After taking a couple of quick snaps I slowly made my way down to the Kobushi-goya 甲武信小屋 (500 yen) where I swiftly made camp and settled in for a well-deserved rest before dinner. As day break neared the rain eased and was pleasantly surprised to find the interior of my tent remained completely dry. Hearing the group staying the hut heading off I tucked into a quick brekkie, grudgingly packed up the wet tent and headed up Mt. Tokusa 木賊山 (2,468 m). A little way after Mt. Tokusa the track forks so take the right trail and rapidly begin the long descent 1,400 m in fact to the Nishizawa Keikoku. The Nishizawa Gorge is one of the most beautiful valleys of the Chichibu Tama Kai National Park and would be a worthwhile day trip in its own right. It takes around 90 minutes to reach another prominent trail juncture. Heading left takes you down the older Chikamaru path 近丸新道 while the right fork uses the newer Tokuchan path 徳ちゃん新道. Both trails take around the same time though the Tokuchan path is more commonly utilised. I went with later and finally after two days of hiking solo came across another backpacker doing the same hike in reverse. The trail exits near the forlorn Nishizawa-sansou 西沢山荘 which also makes for a good lunch site. All that was left was walking along the road following the Fuefuki River 笛吹川 back to the Nishizawa keikoku iriguchi bus stop 西沢渓谷入口 where four daily buses make the trip back to Enzan Station (1 hr, 1,000 yen) click here. Awesome! I loved your pictures of Mt. Kinpu. Amazing!!! I am planning to go hiking there in the beginning of November. Great article and well introduced. Thank you for sharing your amazing experience. Thanks again and happy trails to you! Thanks very much for the kudos! Golden Week is a nice time to tackle this hike and by the looks of your blog write up there weren’t too many camped at the Fujimidaira-goya. Love what you’re doing with your blog also and look forward to following your hiking adventures this year – I have linked Wornout Backpack to my Outdoor Allies blog roll. I’m honored to be listed in your blog roll! Thanks, David! Yes, the camp site was not so full, but maybe because I camped on April 30 (Thursday). It was just days before the actual GW holidays. If I did it on a Saturday, things must have been pretty different! Hi David. Me and my friends plan to follow your way from Kinpu to Kobushi and down to Nishizawa gorge in two day. I wonder if it’s possible. If not, can you suggest us some alternation? Because we don’t know Japanese so once make a plan, we all depend on the review of other experienced mountaineers. Thank you in advance. Hey Pham, sure I can give you some guidance. Yes, it’s possible to complete the hike over two days, provided you are fairly fit. The first day will be same i.e. camping at Oodarumi-toge but the second day you will need to be up early as you’re going to be looking at 9 hours plus walking time not including rest breaks. Unfortunately there isn’t much an alternative other than to turn it into a three-day hike as described. Thank you David. Counting on your comment we decided to excess our trip to 3 days. Lyonrock is passing so hope that we won’t get rain this weekend. I will update after our trip. Probably a wise decision extending it to 3 days. Looks like this weekend they are expecting a bit of rain. I recommend monitoring the latest forecast conditions here: http://goo.gl/OSYS2L. Look forward to hearing how the hike goes. Hi David. I am back. First at all, thank you for very useful and clear information you posted here which helped me, with Japanese level of 0, a lot in my first ever solo trekking. But instead of 3 days trip from Mt. Kinpu to Mt.Kobushi, I just did a 2 days trip to Mt. Mizugaki and Mt. Kinpu with a night camped in Fujimidaira goya. It is more suitable for a beginner like me in which I could spend more time to enjoy fully while still be on time for the bus back to Nirasaki station (the last bus is 3.25 pm on weekdays, 4.35 pm on weekends and holidays). Thanks for the great website, and for this suggested hike. Did it over Golden Week, so going to leave some points for others! Took the 7am Super Azusa from Shinjuku and arrived at Nirasaki at 8.39. The bus was at 8.50, I left Mizugaki-sansou at 10.30 and reached Kinpu-san at 3.30. From half way up Kinpu it was all snow and ice for the next 2 days, so don’t do this if you’re not snow-prepared! The walk down to Oodarumi-toge was mostly fine, and I opted to stay in the hut (¥4,500). Given my boots were soaked from the slushy snow and my feet were freezing, it would have been a long cold night if I’d camped out. Most people were gone the next morning by 5am, but I was a bit lazier and set off at 6.50. I made Kokushigatake by 7.40, and arrived at the 2hr point marked on the map at 10.08. Got a bit lost (following someone else’s footprints) coming down and had to wade about in waist deep snow for 30 mins. At 11.10 I reached the cliff with the stunning Fuji view (most welcome after nothing but snow and trees for 4 hours). At 1.50 I reached the peak of Kobushi. From there, it’s just a few minutes down to Kobushi-goya, where I chose to sleep in again (¥5,500). On the third day I was up at 4.30 and off at 5.10 as the map said it was about 4 hours to the bus stop and the bus was at 9.35. Conscious that I didn’t want to miss the bus, I went both up and down as fast as possible, including some jogs where the path wasn’t too steep. I was up Tokusa by 5.30, and made the junction for the Tokuchan path at 6.30. By 7.40 I was at Nishizawa-sansou and at the bus by a very early 8.15. The bus stop is on the opposite side of the road from a beige building with a curved roof, and there’s no stop. You have to wave it down as it passes. Hope that helps anyone considering this hike. I would definitely recommend it. If I was doing it again I would make reservations at the huts (so I didn’t have to carry my tent) and set off earlier on day 2 to take advantage of the crisp snow.